View this sample resume for a midlevel manufacturing engineer to see how you can improve your resume's quality and highlight your engineering skills. To be a successful candidate for manufacturing jobs, resume expert Kim Isaacs says it helps to have a comprehensive resume. Does your resume need some quality control? 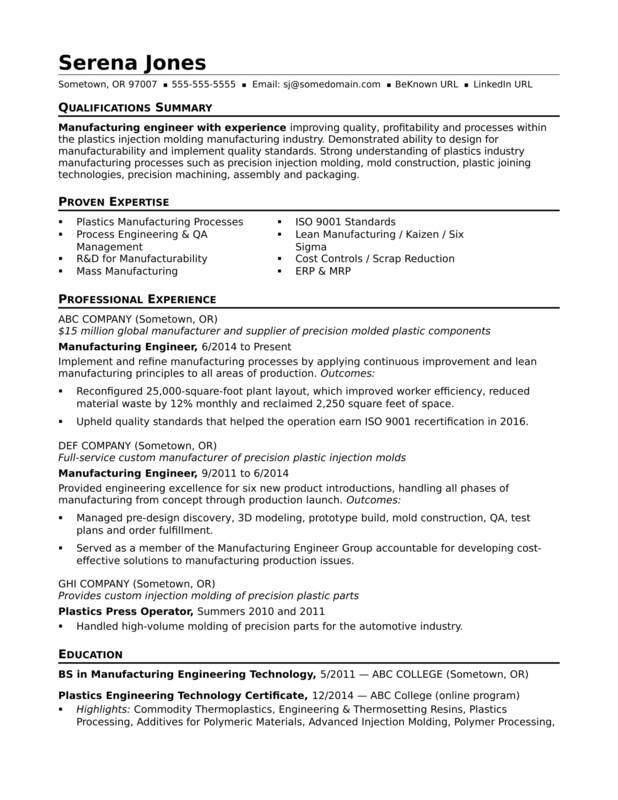 To see how you can improve your resume's quality and highlight your engineering skills, view this sample resume for a midlevel manufacturing engineer that Isaacs created below. You can also download the midlevel manufacturing engineer resume template in Word. And if you need more help, get a free resume evaluation from the experts at Monster's Resume Writing Service. Additionally, you can learn more about manufacturing careers and search for manufacturing engineer jobs on Monster. Manufacturing engineer with experience improving quality, profitability and processes within the plastics injection molding manufacturing industry. Demonstrated ability to design for manufacturability and implement quality standards. Strong understanding of plastics industry manufacturing processes such as precision injection molding, mold construction, plastic joining technologies, precision machining, assembly and packaging. Implement and refine manufacturing processes by applying continuous improvement and lean manufacturing principles to all areas of production. Reconfigured 25,000-square-foot plant layout, which improved worker efficiency, reduced material waste by 12% monthly and reclaimed 2,250 square feet of space. Upheld quality standards that helped the operation earn ISO 9001 certification in 2011. Provided engineering excellence for six new product introductions, handling all phases of manufacturing from concept through production launch. Managed pre-design discovery, 3D modeling, prototype build, mold construction, quality and test plans, and order fulfillment. Served as a member of the Manufacturing Engineer Group accountable for developing cost-effective solutions to manufacturing production issues. Handled high-volume molding of precision parts for the automotive industry.